Despite the little setback, Arsenal was sitting comfortably at the top of the table with a 9-point cushion between Manchester United and us. What was even more surprising, Manchester City was lying at third place. We had 12 wins, 2 draws and 1 defeat, while United had 12 wins, 5 draws and 3 defeats. The FA decided to play a little trick on us, when they arranged us to play Blackburn Rovers twice in the Premier League in just 4 days. Odd as it seems, it was good news for us. Four days later, we came out with 6 points and 6 goals. The first match saw us thrashing them 4-0 away at Ewood Park. Whereas in the return match at Highbury, we were held back by their stout defending and could only manage a 2-0 win. The 4th Round saw us taking on Gillingham in a one-sided affair and we walked away with a 2-0 win. 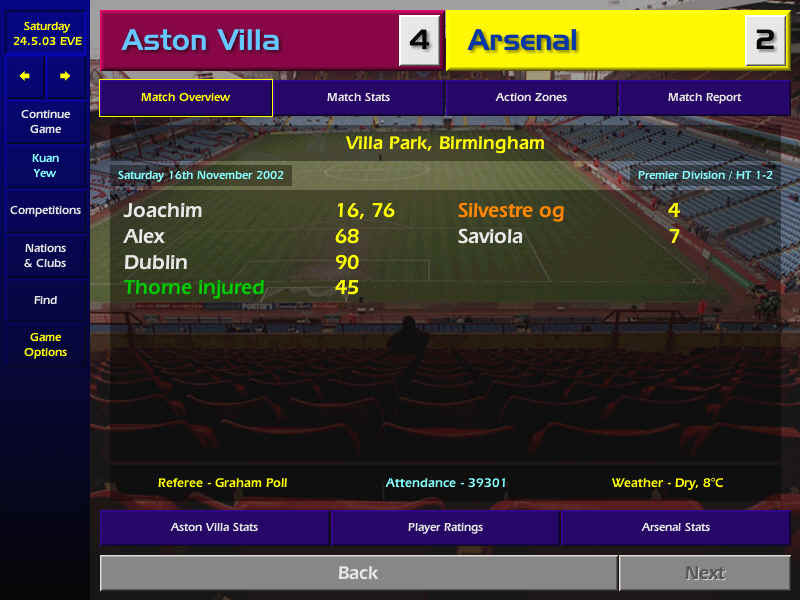 In the League Cup Semi-Final match against Charlton, we led 2-0 at half time through a brace by Saviola but was later caught out by John Robinson's vital away goal in the 82nd minute. 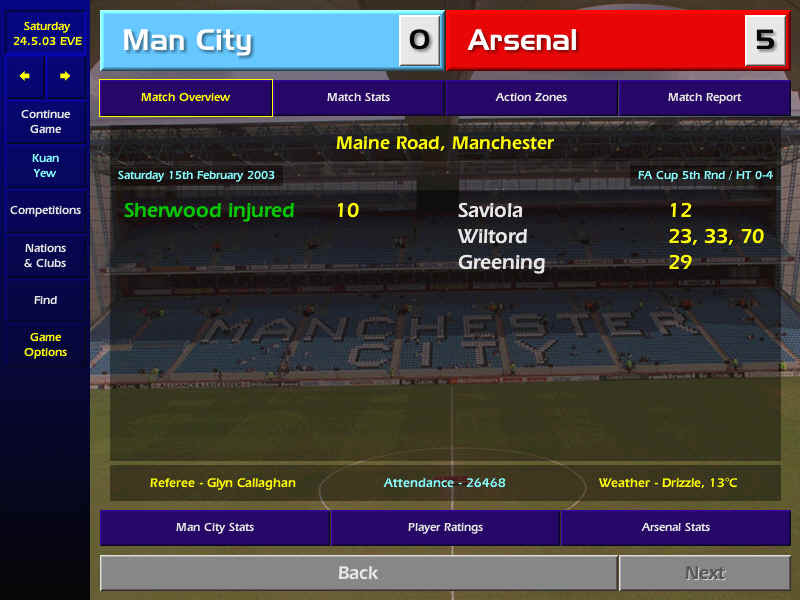 Back to the Premier League, we went through a bad patch right after the match against Blackburn Rovers. We could only draw the next 3 matches against Leicester City (1-1), Chelsea (1-1) and Leeds (2-2). 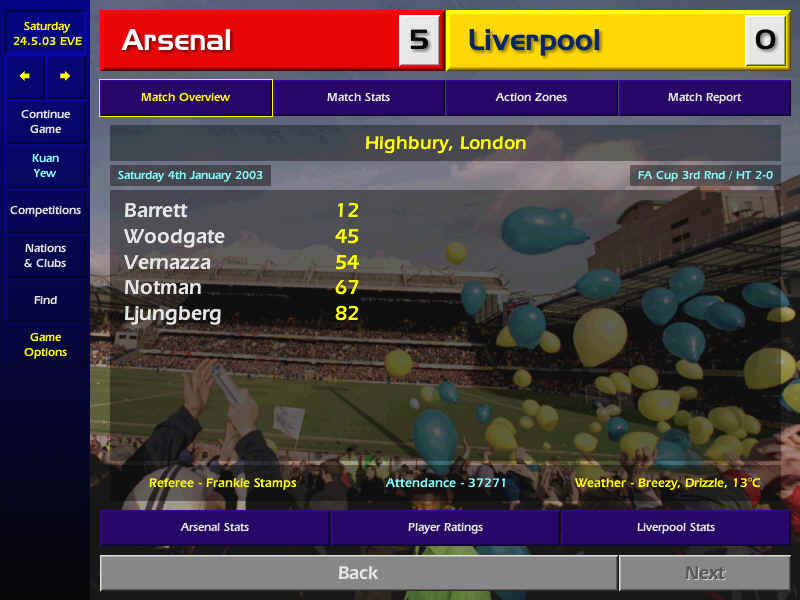 These matches saw us having to make a late comeback to get a point. Luckily, our nearest contenders were going through their own bad patch too and that allowed us to maintain our lead at the top of the table.